Jim Shore's hand-carved Heartwood Creek collectibles impart a sense of hope and nostalgia, embracing inspiring themes of family, tradition, spirituality, and patriotism. 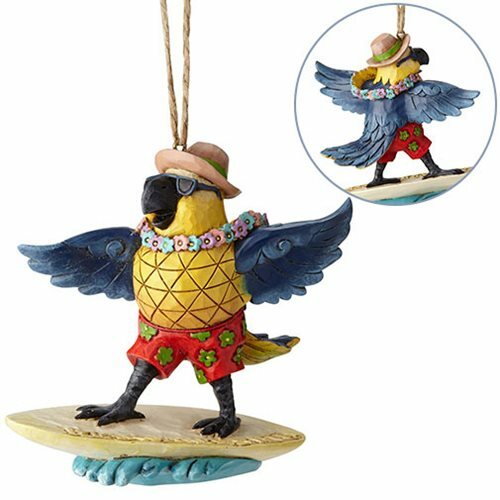 The Margaritaville Surfing Parrot Heartwood Creek Ornament by Jim Shore will take you straight to the tropics. This parrot is living his best life, surfing a wave with a lei around his neck. The colorful design is handcrafted in stone resin and hand-painted. This makes a fun stocking stuffer or gift topper for fun-loving friends. Measures about 4-inches long x 3 3/5-inches tall x 1 3/5-inches wide.